Squeaking in a guinea pig can signify a variety of different and diverse things, whether apprehension or enthusiasm. Cavies can be a rather noisy and expressive bunch. The name "guinea pig" is often believed to be a nod to their piercing vocalizations, which are reminiscent of the actual squeals of pigs. If your guinea pig squeaks a lot, it could mean that he's hungry and is asking you for food -- perhaps dinner or a tasty fruit treat. Guinea pigs reserve squeaking for food to their interactions with people. 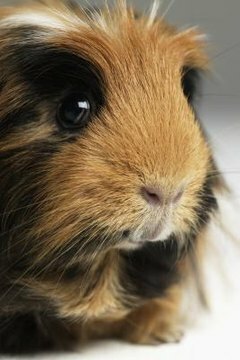 Guinea pigs frequently squeal when they're scared. If you hear your guinea pig persistently squeaking, it could mean that a loud sound from outside bothered him and he's alerting your other cavies to the approaching peril. Squealing in general is often an indication of terror or anxiety in guinea pigs. Excessively shrill squeals frequently denote fright. Guinea pigs also squeal when they're suffering in pain, whether due to a wound, injury or illness. If you think that your guinea pig's squeaking might be pain-related, take him to the veterinarian immediately. Incessant squeaking in a guinea pig can be a sign of attention-seeking behavior. If your guinea pig won't stop squealing, he could be communicating to you that he wants your company. He might want you to pet him for a couple of minutes, or he might want you to play with him. The bottom line is, your wee cavy wants to see you. Squeaking can occasionally point to discomfort from feeling trapped and confused. If your guinea pig is at his annual veterinary appointment, he might squeal a lot as the veterinarian tries to keep him still -- a reaction to a situation that is pretty foreign for the little guy. Guinea pig mothers usually communicate to their offspring through making deep and brief guttural noises. When wee pups are looking for their mothers, they typically squeak. If a young guinea pig has a strong bond with another cavy who isn't his mom, he might squeak to track him down, too. Squealing in guinea pigs often is a sign of joy, nothing more and nothing less. If your cavy squeaks as soon as you walk into the room, it means that he's delighted by your presence -- and perhaps hasn't seen you in a couple hours. Guinea pig communication goes a lot further than simple squealing. Other sounds that are common to the rodents are teeth grinding, purring, groaning and whistling. When they grind their teeth, they're usually notifying others that they're upset and about to fight. When they purr, like felines they're showing feelings of serenity and happiness. A groaning guinea pig is usually trying to get someone to go away. What Does It Mean When Wild Pigs Grunt? What Noises Do Rabbits Make? What Do Rabbits Mean When They Chatter Their Teeth at You?